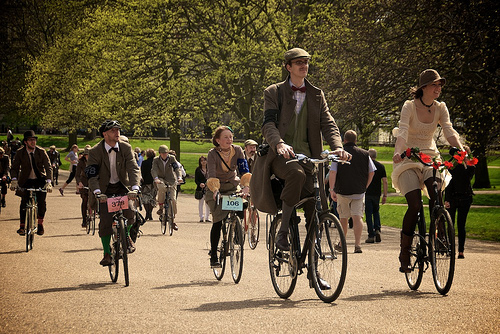 The third annual Tweed Run will be held in London on 9 April and you’re going to need to be both quick and styling a vintage machine if you want to take part. You’re best bet is to get there with a camera because the previous two events have been a feast for the eyes with well-turned-out ladies and gents sporting the tastiest selection of vintage machines you’ll ever see riding in one place. The ride itself will take in 10 miles of central London’s classic sights with a tea-break in the middle sponsored by Aubin & Wills and a dance in Shoreditch at the end. We’re guessing it’ll be more Al Bowlly than Jay-Z. If you do want to ride, entry is £5 which will go to Bikes4Africa; the tougher part is actually getting in. The last two years’ entries have filled in minutes and this time the registration will open at noon on Saturday 26th February. Yes, that’s this Saturday; there’s barely time to grow a moustache. As before, sponsors for the Tweed Run will be Brooks, Pashley, Hunstman, and Geo. F Trumpers.